Tainui Waka ki te hoe! Mā tātou hei hoe te waka o te reo, ko ngā niao, ko te mahi tahi me te manaakitanga. Ko te taurapa ko te Kīngitanga, ko te tauihu ko ngā uri whakatupu.Ko ngā iwi ōna kaihoe, ko Ngā Paemanu ngā māngai o ngā iwi o te rohe o te waka o Tainui. What is the Tainui Investment plan 2018-2019? 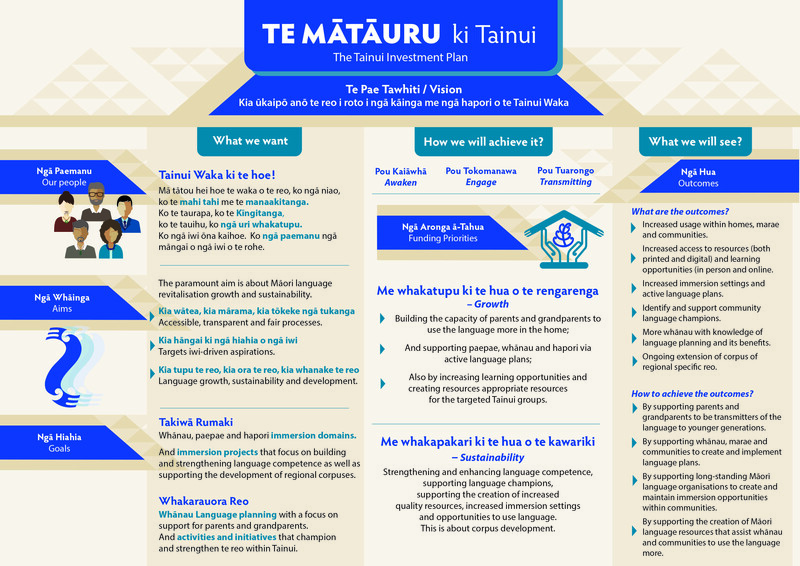 It is the plan for how Te Mātāwai will be investing in te reo Māori revitalisation in the Tainui Waka region that includes Waikato, Maniapoto, Raukawa and Hauraki. The plan is aimed at all uri of all the iwi listed in the Tainui Kahui ā-Iwi in Te Ture mō Te Reo Māori 2016. The Tainui Investment Plan was developed by a core group of te reo Māori advocates called Ngā Paemanu o Tainui or Te Pae Motuhake o Tainui. The members are appointed by iwi and stakeholder organisations within the Tainui Waka region. The plan aligns with the Maihi Māori Strategy with an overall vision to restore te reo Māori as a nurturing first language in homes and communities. 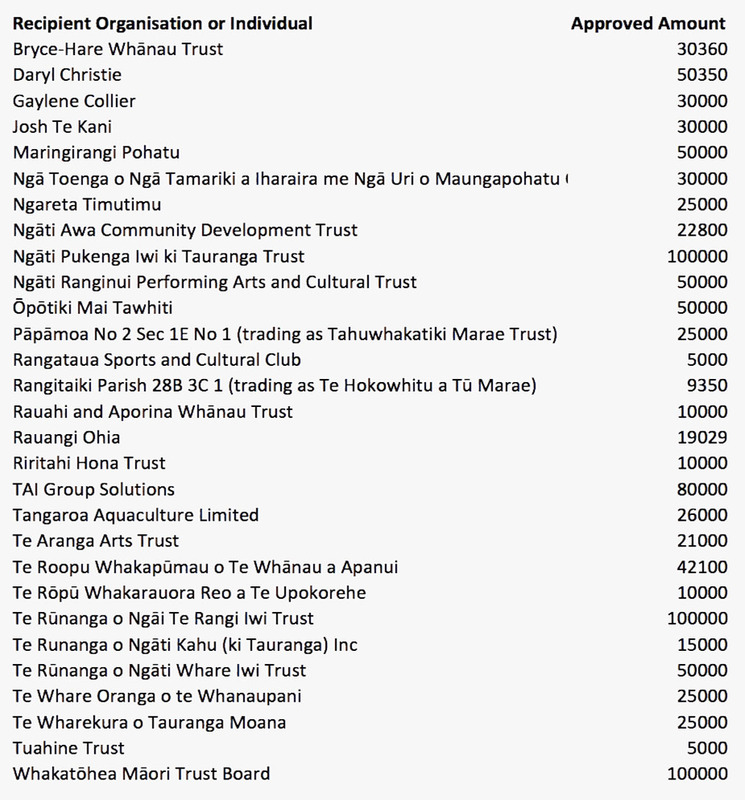 Who is responsible for the Tainui Investment plan? Ngā Paemanu o Tainui is responsible for the plan with monitoring and administrational support from Te Mātāwai. All Māori language stakeholders within Tainui and iwi listed in the Tainui cluster of iwi have a direct interest and responsibility in the implementation of the plan. Who are the members of Ngā Paemanu o Tainui? What are the aims of the plan? Ngā Paemanu o Tainui and Te Mātāwai will ensure that processes are fair and transparent, by making the plan accessible and clear, by promoting engagement and by actively advocating for the plan. The paramount aim is about Māori language revitalisation growth and maintenance within the region. Takiwā Rūmaki: Whānau, paepae and hapori immersion domains. And immersion projects that focus on building and strengthening language competence as well as supporting the development of regional corpuses. Whakarauora Reo: Whānau Language planning with a focus on support for parents and grandparents. And activities and initiatives that champion and strengthen te reo within Tainui. 1) Me whakatupu ki te hua o te rengarenga – Growth. Building the capacity of parents and grandparents to use the language more in the home;And supporting paepae, whānau and hapori via active language plans; Also by increasing learning opportunities and creating resources appropriate resources for the targeted Tainui groups. 2) Me whakapakari ki te hua o te kawariki - Sustainability. Strengthening and enhancing language competence, supporting language champions, supporting the creation of increased quality resources, increased immersion settings and opportunities to use language. This is about corpus development. -Ongoing extension of corpus of regional specific words and phrases. How will we achieve the outcomes? • By supporting parents and grandparents to be transmitters of the language to younger generations. •	By supporting whānau, marae and communities to create and implement language plans. •	By supporting long-standing Māori language organisations to create and maintain immersion opportunities within communities. •	By supporting the creation of Māori language resources that assist whānau and communities to use the language more in the home and in the community and to participate effectively in immersion environments. What will we see as a result of Investments? A growth in Māori speaking whānau/households; more whānau and communities with knowledge of language planning and its benefits; more opportunities to use Māori language in community settings; more resources to support Māori language being used in the home and in the community. Language growth, sustainability and development. What investments were procured in the 2017-2018 Tainui Cluster Investment Round? Events, activities and resources: Koroneihana, Rīketa, Poukai, Hui ā-whānau, Tainui Games, Waenganui Games, Te Reo Ūkaipō (Waikato- Tainui home-based resources, Maniapoto online dictionary, Maniapoto Festival, Tainui Waka Regional Kapa Haka, Upoko Pakaru (Board Game), Te Ara Reta Applications: Waikato-Tainui literacy, Kaumātua Kapa Haka, Te Ataarangi Kura Pō and Kāinga Kōrerorero. Wānanga Reo/Kura Reo ā-Iwi: Raukara Kura Reo, Te Reo Kaakaho (Waikato Tainui tribal members) Te Reo Kaapuia (teachers), He Reo Aratau & Taiohi Kaakaho (Waikato-Tainui taiohi), Te Whare Tāhuhu Kōrero o Hauraki, Wānanga Reo ki Te Nehenehenui, wānanga reo ā-hapū, ā-marae, ā-iwi, Te Ohu Reo o Hauā. Ngā Mahere Reo: Mahere ā-Iwi: Hauraki, Maniapoto, Raukawa, Waikato & Ngāti Hineuru.Mahere ā-Marae: Pōhara & Whakamārama. * The Tainui Investment Round for 2017-2018 closed on 26 January 2018, applications were then assessed and 20 applications for te reo Māori revitalisation across the Tainui Waka Cluster were approved.